As a parent, do you ever feel like, no matter how hard you try, you never get a spare minute to get things done? And then, when you actually do get a free minute, you have to attempt to do everything one-handed while you are holding your fussy child! Being a new parent can definitely have its challenges, but having to choose between getting your daily routine done and tending to your fussy child shouldn’t have to be one of them. One of the best decisions you can make for yourself as a new parent is to buy a kid carrier, so you don’t have to stress about trying to keep up with your daily tasks while tending to your child. When it comes to shopping for that perfect kid carrier, there are a few key factors that you will want to keep in mind. One of the most important aspects when it comes to carriers is to make sure that the product can withstand the desired weight. This is not only important for your child’s safety, but for your safety as well. You will also want to determine where you plan on using the carrier and how often. If you just plan on using it around the house or while you are grocery shopping and running errands, then a simple wrap would work just fine. If you plan on using it while you are hiking, then you will want something a bit sturdier. Comfort is another important aspect to keep in mind, for both you and your child. Below is a list of the best 10 kid carriers that keep all of the aspects in mind. If you are looking for a comfortable and secure way to carry your child, then this is the choice for you. Made from mostly cotton, this baby wrap was designed to be comfortable for both you and your child. Equipped with an easy-tie design, this wrap has the perfect amount of stretch without losing shape, all while keeping your child secure. 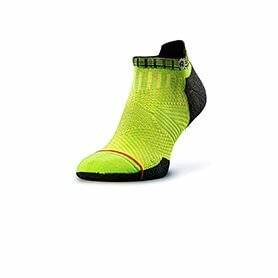 With the ability to hold up to 35 pounds and having 3 different colors to choose from, you are sure to find the perfect fit for you. This wrap is made from a combination of cotton and spandex, so it was made to be comfortable. With 95% being cotton and the other 5% being spandex, this product has the perfect balance of stretch and comfort, so you and your child can be comfortable at all times. The spandex also helps it maintain its shape, so you never have to worry about it overstretching. This product was also designed with ease in mind. Its unique easy-tie design allows for a more secure and efficient tie each and every time. It also comes with a booklet that has illustrated instructions, so it takes out all of the guesswork. In comparison to other kid carriers on this list, this one falls into the less expensive price range. Considering the fact that you are getting a durable product made from high-quality cotton and spandex that is equipped with an easy-tie design, is machine washable, can hold up to 35 pounds, and comes in 3 color choices, you are getting an amazing product for a price that won’t break the bank! If comfort and ease are a priority on your list, then this is the ideal choice for you. Made from 100% cotton, this wrap’s sole purpose is the comfort for both you and your child. Its easy-to-use design allows you to use in 5 different positions without a complicated wrap system, so you can adjust according to your comfort level without any kind of confusion. Available in 3 different color choices, you are sure to find one that works best for you. This product was designed with overall comfort in mind. It is made from 100% cotton, so it is not only soft and comfortable for your child, but for you and your shoulders as well. This material is also machine washable, won’t overstretch, and can hold up to 35 pounds, so you know it was made to last. Not only is this product comfortable, but it is practical as well. This wrap offers 5 different positions without having to deal with complicated ties. It slips on just as easy as a t-shirt no matter what position you want your child in, so you won’t have to deal with the stress of trying to figure out how to tie it securely. When compared to other kid carriers on this list, this one falls into the average price range. Given the fact that you are getting a premium wrap that is made from 100% cotton, offers 5 different positions with an easy slip-on design, and is available in 3 different colors to choose from, you are getting a high-quality product for an incredible price. Looking for a convertible carrier that is ergonomic and convenient? Then this is the perfect choice for you! This product offers an adjustable ergonomic seat that can grow along with your child and 4 different carrying positions so your child can remain happy and content for as long as you need. It also has padded shoulder straps, so you can remain comfortable the entire time you are carrying your child. This product comes equipped with an adjustable ergonomic seat that can adjust from a narrow setting to a wider setting. 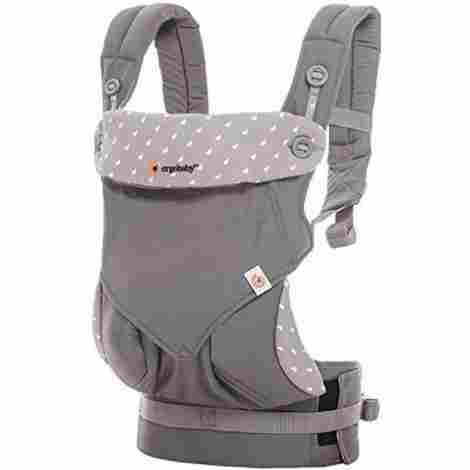 This design allows this carrier to grow along with your child, keeping both of you comfortable and secure. This product was designed with functionality and ease in mind. It offers 4 different positions for the different stages that your child goes through. You can face it so that it faces you with the seat narrowed, which is more for the infant stage, front-facing with the wider seat as they become a couple months older and more stable, facing out for when the child has better head stability, and back carrying for when the child is older. If you are looking for a product that focuses on convenience and comfort without having to worry about emptying your wallet, then this is the perfect one for you! In comparison to other carriers on this list, this one falls into the less expensive price range. Considering that you are getting a premium product designed with comfort and functionality in mind, equipped with extra padding in the shoulder straps, offers 4 convenient positions and grows along with your child, you are getting an amazing product for a price that you can’t say no to. Made from cotton, this product was designed with both comfort and security in mind. Designed with an adjustable buckle, you can accommodate the size according to your child. It also comes equipped with a headrest that offers support of the neck and head, securing your baby in softness. Offering 2 different positions and 3 different color choices, this product sure aims to please! This product is equipped with an adjustable buckle, which is perfect for your growing child. The buckles are color-coated, so you will always know that you are buckling your child correctly and safely. Not only does this feature help keep your child safe and secure, but it helps you feel comfortable as you are carrying your bundle of joy. This product also offers a headrest that is adjustable, so it can accommodate your child’s specific needs. This headrest also acts as a head and neck support system, so you won’t have to worry about your little one getting jostled around while they are in the carrier. In comparison to other kid carriers on this list, this one falls into the more expensive price range, but don’t let this price steer you in another direction. Keep in mind that you are getting a high-quality cotton carrier that offers 2 different carrying positions, an adjustable buckle for added security, an adjustable headrest that supports the head and neck, and comes in 3 different colors choices, you are getting an incredible product for a decent price! Are you looking for a secure, comfortable way to bond with your baby? If you answered yes, then this is the ideal choice for you. Made from a perfect combination of cotton and spandex, this product focuses on the overall comfort of your child. This product allows you to work hands-free all while keeping your child close to your heart. Coming in a variety of colors to choose from, you can use this versatile wrap for anything from taking a grocery shopping trip to breastfeeding and you won’t be disappointed. This product was made with the ultimate comfort and security in mind. Made from a combination of cotton and spandex, this wrap comfortable wraps your child close to your chest and has the perfect amount of stretch. The spandex allows the product to stretch the perfect amount without losing its shape or overstretching. This product can also be used for multiple different functions. It not only acts as a carrier for a child, but it can be used for breastfeeding, used as a sling carrier, and even as a postpartum belt to help add stability to the abdomen and help reduce any swelling that you might have. When you compare this kid carrier to other ones on this list, this one falls into the less expensive price range. Given the fact that you are getting an amazing product made from the perfect combination of cotton and spandex, has multiple functions, and comes in a wide variety of colors to choose from, you are getting a high-quality product for a fantastic price that is all backed by a 30-day risk free money back guarantee and a lifetime warranty on their product! If the overall fit and comfort are what you are looking for, then this is the perfect choice for you! Made from 100% cotton, this product was designed for a comfortable fit for you and your baby. Equipped with a lumbar support for you and an ergonomic interior for your little one, you can carry your child around with ultimate comfort and ease. Offering 6 different carrying positions and a whole array of colors to choose from, you will be happy that you made this choice! This product was designed to not only be comfortable for your child but for you as well. 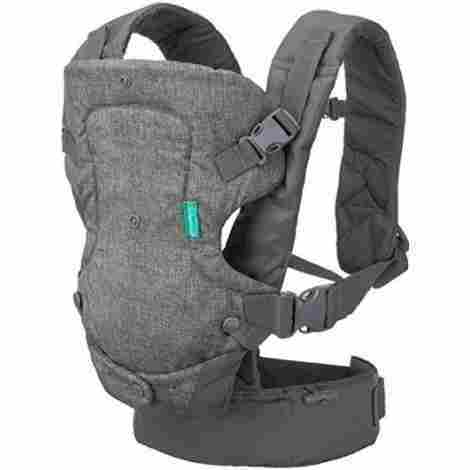 This carrier is equipped with an ergonomic design for your child, offering an abundance of neck and head support, so no infant insert is needed. It also offers lumbar support for you, so you don’t have to worry about hurting your back. This carrier was also made with breathability in mind. Made from cotton and a unique 3D mesh, your child will remain comfortable at all times. This design allows for the material to breathe and maximizes airflow, so your child won’t overheat! In comparison to other kid carriers on this list, this one falls into the more expensive price range, but don’t let the price scare you off. This product offers an ergonomic design made from cotton mesh with 6 different position options, a headrest that offers neck and head support, lumbar support for you, is machine washable and comes in a wide variety of colors to choose from, so you are getting a high-quality product for a great price! If you are looking for a product that pretty much does it all, then look no further because this is the ideal choice for you! This product was designed with both you and your baby in mind. 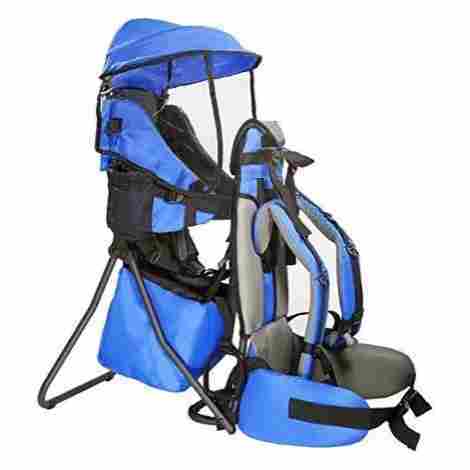 Designed with an adjustable seat for your child, this carrier actually grows along with your child. It also comes with lumbar support for you and is equipped with a waistband that can adjust to your size. If that wasn’t enough, it also comes with a hideaway hood that offers sun and wind protection. Available in a wide variety of colors, you are sure to find the perfect one for you! This product was designed with overall functionality and comfort in mind. It is equipped with an adjustable seat that can adapt to your child’s growth. It also has an adjustable waistband that wraps around and can be adjusted to fit your size. This means that as you lose the baby weight, you won’t have to worry about having to buy another carrier. A really unique feature that this product offers is a hideaway hood. This hood easily folds out when you need it and tucks away when you don’t. It has UPF 50+ protection and offers protection from wind. This hood works perfectly for breastfeeding too! In comparison to other kid carriers on this list, this one falls into the more expensive price range, but don’t let the price steer you in the wrong direction. Given the fact that you are getting a premium product made from 100% cotton, has an adjustable seat that grows along with your child, lumbar support with an adjustable waistband for added comfort, a hideaway hood that offers wind and sun protection, is machine washable, and comes in a variety of colors to choose from, you really can’t go wrong with this product! If you enjoy taking long walks or going on hikes so you are in need of a product that offers a little more stability and security for both you and your child, then this is the perfect carrier for you! Made from a durable, foldable aluminum frame that is lightweight and easy to carry, this product was built for those who love the outdoors. Equipped with oxford cloth, padded shoulders, pockets for storage, footrests for your child and a removable canopy, this product makes hiking and walking with your child an absolute breeze! This product was made with the ultimate durability in mind. It has a durable aluminum frame that folds up and contains 600 denier oxford fabric, so you know that this was built for the rugged outdoors and won’t have to worry about it breaking or tearing. This product was not only built to be durable, but it was built for comfort as well. It is equipped with extra padding in the shoulders for maximum comfort and also contains footrests for your child’s feet. This means that both you and your child can remain comfortable the entire time. When compared to other kid carriers on this list, this one falls into the more expensive price range. Considering the fact that you are getting a high-quality product made with an aluminum frame and 600 denier oxford fabric, extra padding in the shoulders for added comfort, footrests for your child, a removable canopy to help shield your child from the wind and sun, and comes in a variety of colors to choose from, you are getting an amazing product for a great price! This product was made with comfort and functionality in mind. Made from a combination of cotton and spandex, this wrap offers the ultimate level of comfort for your little one. Its one size fits all design allows for you to adjust according to your size and comfort level. With the ability to hold up to 35 pounds, being machine washable, and offering multiple different functions, this wrap is a definite must-have! This product is made from the perfect combination of cotton and spandex. The cotton offers a soft, comfortable feel, while the spandex allows the wrap to stretch without having to worry about sagging or overstretching. This means that you can walk around with peace of mind that your child is wrapped up comfortably and safely. The whole purpose of a kid carrier is to allow you to get things done all while holding and bonding with your child, so it can be frustrating when the product you buy never really seems to fit right. You won’t have to worry about that issue with this product because it was made with an ergonomic design that allows for a perfect fit without having to worry about constantly having to stop and readjust, which will make both you and baby happy! If you are looking for a high-quality product that won’t put a huge dent in your bank account, then this is the ideal choice for you. When compared to other kid carriers on this list, this one falls into the less expensive category. Given the fact that you are getting a durable product made from a combination of cotton and spandex, has an ergonomic design that makes for the perfect fit, can hold up to 35 pounds, can be used for various different functions, is machine washable, and comes in 3 different color choices, you are getting an amazing product for an incredible price that you can’t walk away from! Made from a combination of cotton and polyester, this product focuses on overall comfort and breathability. Its ergonomic design with a hip seat allows for your child to sit comfortably and in a position that is more natural. It also comes with a removable head support for younger babies and a back support to help with overall comfort. Coming with a removable hood that helps protect against the sun and wind and 2 different color options to choose from, this product sure aims to please! This product really focuses on the overall comfort of the child. Made from a combination of cotton and polyester, your child will never want to get out of this carrier. The cotton makes for a softer feel and helps eliminate any friction or rubbing on your child’s skin. The polyester makes this a breathable product and maximizes airflow, so your child stays comfortable no matter what the temperature is. This product is also equipped with a head support that is foldable, which is perfect for your little infant. It also has extra back support to help with posture and to help support the head and neck, so you can rest assured that your little one will be both comfortable and secure. In comparison to other kid carriers on this list, this one falls into the average price range, which is great news for you! Given the fact that you are getting a premium product made from a combination of cotton and polyester making this both comfortable and breathable, has added head and back support, is equipped with a hip seat that helps your child sit in a position that is more natural, is equipped with a removable hood that protects your child from the elements, and comes in 2 different colors choices, you are getting an incredible deal on an amazing product. After looking at this list, you can see that there are a few different options out there when it comes to kid carriers. Choosing the right one for you can make a world of difference for both you and your child. There are a few aspects to keep in mind when you are shopping for your new carrier. One of the most important aspects is the comfort, and I am talking about comfort for both you and your child. Finding a carrier that offers support for both of you is imperative because both of you need to be comfortable, or it will just end up being a negative experience and that’s not the purpose of having a carrier. Another important aspect to keep in mind is where you primarily plan on using this product and for how long throughout your day. The reason that this is important is that not all kid carriers are created equal. Some are wraps that are great for quick trips to the store, or zoo, or even getting your housework done. Others are designed more for hiking or longer walks, so they tend to be a bit bulkier. Keeping these factors in mind will help you along when looking for that perfect carrier. One of the most important aspect to keep in mind when you are shopping for a kid carrier is the overall safety of your child. You will definitely want to make sure that the product you choose is going to be safe and suitable for your child and their size. Some products are specifically designed for infants, some are designed for older babies with better head control, and others are designed to grow along with your child from infancy on up. Carriers that are designed for infants offer added heck and neck support, so your baby can have the proper positioning that keeps their airway open and protected. Some carriers have infant inserts that are removable as the child gets older and others are designed so that it does not need the insert and can adjust as your child grows. The material is another important aspect to keep in mind. The material that the product is made of will play an important role in how comfortable it is. Some people prefer certain materials over others, so the choice really has more to do with personal preference than anything else. There are a few different kinds of material used to make carriers; cotton, spandex, and polyester. Cotton is a very common material that is used and this is primarily because of how soft it feels against the skin. This material helps with overall comfort because it can help eliminate any unnecessary rubbing and chafing of the skin. Spandex is generally used more for its elasticity. This material is known for its ability to stretch without losing its shape or form, so it is perfect for this type of product. Polyester is known for being a breathable material and it also has moisture-wicking and quick-drying capabilities, so it keeps your child at a comfortable temperature. It is not as soft as cotton and some may say that it feels a bit like plastic against your skin. The overall function of the carrier is another important aspect. You want to make sure that you are getting a product that best suits your needs. For example, if you are looking for a product that you can use while you are doing housework or going grocery shopping, then a wrap style would probably work best for you. If you are planning on taking longer walks or going hiking, then you are going to want a product that offers more stability for both you and your child. Even though a wrap is secure and comfortable, it may not best safe or that comfortable for longer stretches of time. You might also want to keep in mind as to whether or not the product is machine washable. This can make your life a lot easier when it comes to cleaning up messes, and let’s face it, kids aren’t known for being clean! Right up there with safety, weight capacity is extremely important. Most carriers are designed to withstand up to 30-35 pounds, but not all of them are built the same way. It is always important to check the weight limits on the product to ensure proper safety and to make sure that the product is suitable for your child. As with anything you invest your money into, the cost is always an important factor. The cost of kids carriers can depend a lot on their specific features and what they are designed for. For example, an ergonomic carrier that offers extra support and padding might cost more than a regular wrap that may not offer those types of features. Remember, a product like this is for your child, so you want to make sure that it is safe and made to handle what you have intended for it. There really shouldn’t be an amount you wouldn’t spend when it comes to the overall safety and well-being of your child! Q: How do I know what style or design is best for my infant child? A: The answer to that question really has to do with what you feel comfortable with. 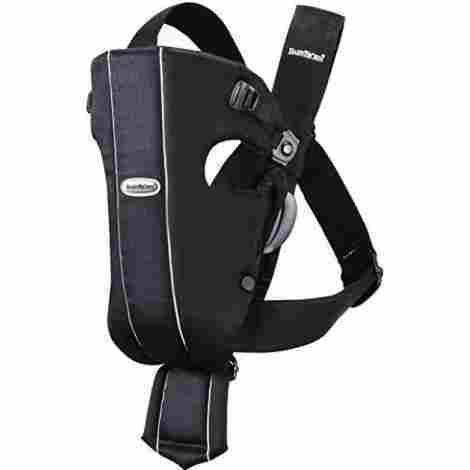 Looking for a carrier that offers added infant support for the head and neck is very important. 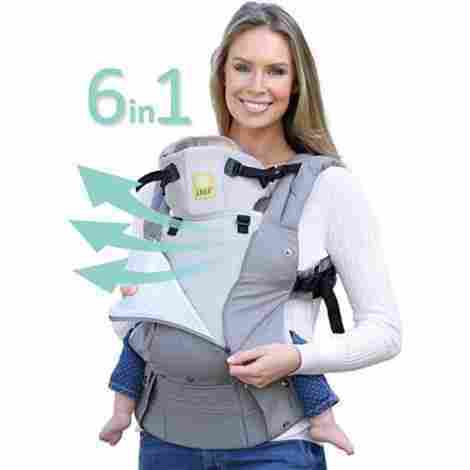 Some carriers come with infant inserts that you add to the carrier until your child has better head stability and control and others have the support that is added to it, so there is no need for an insert. Some wraps are designed specifically for infants, so those can be safe too. It is important to always check the product information to make sure that the product is safe for your little one. Q: What is the difference between a sling and a wrap? A: A sling is a wide piece of fabric that is designed to be worn across your body and draped over one shoulder. Slings are a great product when it comes to breastfeeding because they are usually a looser fit, but can start to become uncomfortable when your baby starts to weigh more because all of the weight is resting on one shoulder. Wraps are also made of fabric, but instead of being draped over one shoulder, they are designed to wrap around your body and both shoulders, giving you better support. This type of design makes it easier for you to carry your child around hands-free, so it makes multitasking a breeze. Although they do offer more support than a sling, they can be a bit challenging to put on and figuring out how to tie them securely. Q: What type of carrier works best for those who have back issues? A: Carriers that offer some type of back support are a great choice. The added support and padding helps to reduce the amount of stress that is put on your back and helps distribute the weight more evenly. Some wraps are even a good choice because they also help with distributing the weight, so your back isn’t taking the bulk of the impact.